"Fourth of July" and "4th of July" redirect here. For the date, see July 4. For other uses, see Independence Day (disambiguation). For other related material, see Fourth of July (disambiguation). Independence Day (colloquial: the Fourth of July) is a federal holiday in the United States commemorating the Declaration of Independence of the United States on July 4, 1776. The Continental Congress declared that the thirteen American colonies were no longer subject (and subordinate) to the monarch of Britain and were now united, free, and independent states. The Congress had voted to declare independence two days earlier, on July 2, but it was not declared until July 4. In 1777, thirteen gunshots were fired in salute, once at morning and once again as evening fell, on July 4 in Bristol, Rhode Island. An article in July 18, 1777 issue of The Virginia Gazette noted a celebration in Philadelphia in a manner a modern American would find familiar: an official dinner for the Continental Congress, toasts, 13-gun salutes, speeches, prayers, music, parades, troop reviews, and fireworks. Ships in port were decked with red, white, and blue bunting. In 1783, Salem, North Carolina held a celebration with a challenging music program assembled by Johann Friedrich Peter entitled The Psalm of Joy. The town claims to be the first public July 4 event, as it was carefully documented by the Moravian Church, and there are no government records of any earlier celebrations. Independence Day is a national holiday marked by patriotic displays. Similar to other summer-themed events, Independence Day celebrations often take place outdoors. According to 5 U.S.C. § 6103, Independence Day is a federal holiday, so all non-essential federal institutions (such as the postal service and federal courts) are closed on that day. Many politicians make it a point on this day to appear at a public event to praise the nation's heritage, laws, history, society, and people. The night before the Fourth was once the focal point of celebrations, marked by raucous gatherings often incorporating bonfires as their centerpiece. In New England, towns competed to build towering pyramids, assembled from barrels and casks. They were lit at nightfall to usher in the celebration. The highest were in Salem, Massachusetts, with pyramids composed of as many as forty tiers of barrels. These made the tallest bonfires ever recorded. The custom flourished in the 19th and 20th centuries and is still practiced in some New England towns. Independence Day fireworks are often accompanied by patriotic songs such as the national anthem, "The Star-Spangled Banner"; "God Bless America"; "America the Beautiful"; "My Country, 'Tis of Thee"; "This Land Is Your Land"; "Stars and Stripes Forever"; and, regionally, "Yankee Doodle" in northeastern states and "Dixie" in southern states. Some of the lyrics recall images of the Revolutionary War or the War of 1812. New York City has the largest fireworks display in the country, with more than 22 tons of pyrotechnics exploded in 2009. It generally holds displays in the East River. Other major displays are in Seattle on Lake Union; in San Diego over Mission Bay; in Boston on the Charles River; in Philadelphia over the Philadelphia Museum of Art; in San Francisco over the San Francisco Bay; and on the National Mall in Washington, D.C.
During the annual Windsor–Detroit International Freedom Festival, Detroit, Michigan hosts one of the largest fireworks displays in North America, over the Detroit River, to celebrate Independence Day in conjunction with Windsor, Ontario's celebration of Canada Day. The first week of July is typically one of the busiest United States travel periods of the year, as many people use what is often a three-day holiday weekend for extended vacation trips. In addition to a fireworks show, Miami, Florida, lights one of its tallest buildings with the patriotic red, white and blue color scheme on Independence Day. New York City's fireworks display, shown above over the East Village, is sponsored by Macy's and is the largest in the country. Held since 1785, the Bristol Fourth of July Parade in Bristol, Rhode Island, is the oldest continuous Independence Day celebration in the United States. Since 1868, Seward, Nebraska, has held a celebration on the same town square. In 1979 Seward was designated "America's Official Fourth of July City-Small Town USA" by resolution of Congress. Seward has also been proclaimed "Nebraska's Official Fourth of July City" by Governor James Exon in proclamation. Seward is a town of 6,000 but swells to 40,000+ during the July 4 celebrations. Since 1912, the Rebild Society, a Danish-American friendship organization, has held a July 4 weekend festival that serves as a homecoming for Danish-Americans in the Rebild Hills of Denmark. The Boston Pops Orchestra has hosted a music and fireworks show over the Charles River Esplanade called the "Boston Pops Fireworks Spectacular" annually since 1973. The event was broadcast nationally from 1991 until 2002 on A&E, and since 2002 by CBS and its Boston station WBZ-TV. WBZ/1030 and WBZ-TV broadcast the entire event locally, and from 2002 through 2012, CBS broadcast the final hour of the concert nationally in primetime. 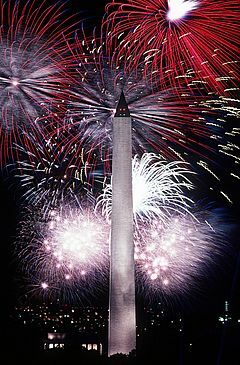 The national broadcast was put on hiatus beginning in 2013, which Pops executive producer David G. Mugar believed was the result of decreasing viewership caused by NBC's encore presentation of the Macy's fireworks. The national broadcast was revived for 2016, and expanded to two hours. In 2017, Bloomberg Television took over coverage duty, with WHDH carrying local coverage beginning in 2018. The Philippines celebrates July 4 as its Republic Day to commemorate that day in 1946 when it ceased to be a U.S. territory and the United States officially recognized Philippine Independence. July 4 was intentionally chosen by the United States because it corresponds to its Independence Day, and this day was observed in the Philippines as Independence Day until 1962. In 1964, the name of the July 4 holiday was changed to Republic Day. Rebild National Park in Denmark is said to hold the largest July 4 celebrations outside of the United States. ^ a b "What is Independence Day in USA?". Tech Notes. July 2, 2015. Retrieved July 2, 2015. ^ "National Days of Countries". Ministry of Foreign Affairs and Trade. New Zealand. Archived from the original on August 25, 2011. Retrieved June 28, 2009. ^ Central Intelligence Agency. "National Holiday". The World Factbook. Archived from the original on May 13, 2009. Retrieved June 28, 2009. ^ "National Holiday of Member States". United Nations. Archived from the original on July 2, 2012. Retrieved June 28, 2009. ^ Staff writer (July 1, 1917). "How Declaration of Independence was Drafted" (PDF). New York Times. Retrieved November 20, 2009. On the following day, when the formal vote of Congress was taken, the resolutions were approved by twelve Colonies–all except New York. The original Colonies, therefore, became the United States of America on July 2, 1776. ^ "Letter from John Adams to Abigail Adams, 3 July 1776, 'Had a Declaration…'". Adams Family Papers. Massachusetts Historical Society. Archived from the original on August 25, 2011. Retrieved June 28, 2009. ^ Burnett, Edward Cody (1941). The Continental Congress. New York: W.W. Norton. pp. 191–96. ISBN 978-1104991852. ^ Warren, Charles (July 1945). "Fourth of July Myths". William and Mary Quarterly. 3d. 2 (3): 238–272. ^ "Top 5 Myths About the Fourth of July!". History News Network. George Mason University. June 30, 2001. Archived from the original on July 3, 2009. Retrieved June 28, 2009. ^ For the minority scholarly argument that the Declaration was signed on July 4, see Wilfred J. Ritz, "The Authentication of the Engrossed Declaration of Independence on July 4, 1776" Archived August 18, 2016, at the Wayback Machine, Law and History Review 4, no. 1 (Spring 1986): 179–204, via JSTOR. ^ Meacham, Jon (2012). Thomas Jefferson: The Art of Power. Random House LLC. p. 496. ISBN 978-0679645368. ^ "James Monroe - U.S. Presidents". HISTORY.com. Archived from the original on March 23, 2018. Retrieved July 4, 2018. ^ Klein, Christopher (July 1, 2015). "8 Famous Figures Born on the Fourth of July". HISTORY.com. Archived from the original on July 4, 2018. Retrieved July 4, 2018. ^ Heintze, "The First Celebrations". ^ a b c Heintze, "A Chronology of Notable Fourth of July Celebration Occurrences". ^ Graff, Michael (November 2012). "Time Stands Still in Old Salem". Our State. Archived from the original on October 4, 2015. Retrieved July 4, 2018. 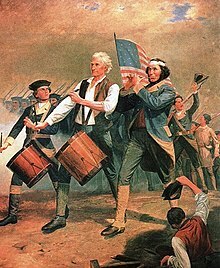 ^ Heintze, "How the Fourth of July was Designated as an 'Official' Holiday". ^ Heintze, "Federal Legislation Establishing the Fourth of July Holiday". ^ "The Night Before the Fourth". The Atlantic. July 1, 2011. Archived from the original on October 25, 2011. Retrieved November 4, 2011. ^ "Origin of the 21-Gun Salute". U.S. Army Center of Military History. October 3, 2003. Archived from the original on June 19, 2014. Retrieved July 4, 2014. ^ a b Biggest fireworks show in U.S. lights up sky Archived July 1, 2012, at the Wayback Machine, USA Today, July 2009. ^ Nelson, Samanta (July 1, 2016). "10 of the nation's Best 4th of July Firework Shows". USA Today. Archived from the original on July 3, 2018. Retrieved July 3, 2018. ^ Newman, Stacy. "Freedom Festival". Encyclopedia of Detroit. Detroit Historical Society. Archived from the original on July 3, 2018. Retrieved July 3, 2018. 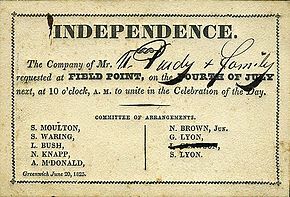 ^ "Founder of America's Oldest Fourth of July Celebration". First Congregational Church. Archived from the original on March 23, 2014. Retrieved March 23, 2014. ^ "History of Seward Nebraska 4th of July". Archived from the original on July 13, 2011. ^ "History". Rebild Society. Rebild National Park Society. Archived from the original on July 1, 2009. Retrieved June 30, 2009. ^ "2009 Macy's 4th of July Fireworks". Federated Department Stores. April 29, 2009. Archived from the original on August 25, 2011. Retrieved July 4, 2009. ^ "Welcome to Boston's 4th of July Celebration". Boston 4 Celebrations Foundation. 2009. Archived from the original on August 22, 2008. Retrieved July 4, 2009. ^ Powers, Martine; Moskowitz, Eric (June 15, 2013). "July 4 fireworks gala loses its national pop". The Boston Globe. Archived from the original on June 19, 2013. Retrieved June 16, 2013. ^ "With CBS on board again, Keith Lockhart is ready to take over prime time". Boston Herald. July 2016. Archived from the original on July 2, 2016. Retrieved July 2, 2016. ^ "7News partners with Bloomberg TV to air 2018 Boston Pops Fireworks Spectacular". WHDH. June 21, 2018. Archived from the original on June 22, 2018. Retrieved June 22, 2018. ^ Lindsey Galloway (July 3, 2012). "Celebrate American independence in Denmark". Archived from the original on November 15, 2014. Becker, Carl L. (1922). The Declaration of Independence: A Study in the History of Political Ideas. New York: Harcourt, Brace. ISBN 978-0-394-70060-1. Retrieved June 28, 2009. Heintze, James R. "Fourth of July Celebrations Database". American University of Washington, D.C. Retrieved February 10, 2015. 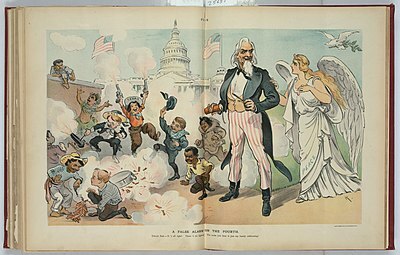 Wikimedia Commons has media related to Independence Day (United States).